A satirical approach to the seriousness of life with a "Dylan-esqe" style of writing, and hair to match! "Sharp wit and humour" with an "Off the Wall" funny view of what many disguise in themselves. Insightful humor, provoking the audience to "look at who lives next door". You may have seen him perform on CTV's Comedy Now ,Comedy at Club 54, as well as many performances at Fundraisers, Corporate Events and Comedy Festivals across Canada. An avid dog lover, Chris has performed with his dogs on Breakfast Television; performed at shows for the Canadian Kennel Club; and helped raise funds for animal shelters in need. 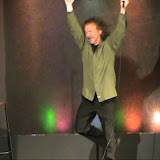 A seasoned professional who performs comedy for his "love of the art" and just making people laugh!!! website hosting by design519.com .